A Beijing man was sentenced to three years in prison with a four-year reprieve by a local court Friday for using a fake hospital stamp to avoid 172,000 yuan ($27,608) in medical fees for his wife's kidney dialysis treatment over four years. Liao Dan, a 41-year-old unemployed man, was sued by the prosecutor's office of Dongcheng district in July after he defrauded the Beijing Hospital by using receipts with a forged seal so that his wife, Du Jinling, could receive dialysis. Liao could not afford the monthly treatment costs of 5,000 yuan. He initially faced a sentence of up to 10 years for defrauding the hospital, but his case triggered an outpouring of public sympathy. Donations totaling 500,000 yuan, enough to cover 10 years of dialysis, were raised by the public for the family, the Beijing Evening News reported Friday. Liao used part of this money to repay in full his outstanding medical fees. Liao welcomed Friday's verdict, the most lenient expected, handed down by the Dongcheng District People's Court. 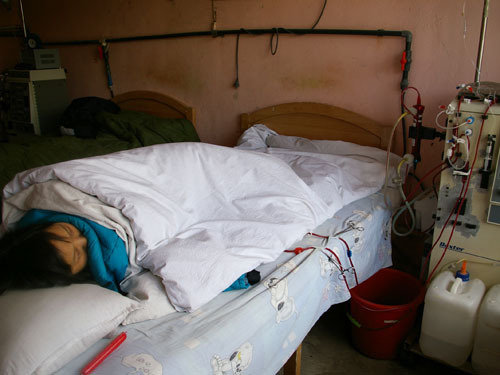 "The medical treatment for dialysis has been paid for by the donations. I won't rule out a kidney transplant operation for my wife as long as there's a match," he said. Liao's wife Du, who is from Hebei Province, was unable to get her medical expenses reimbursed because she does not have a Beijing hukou, or household registration permit. Liao and his wife live on a monthly subsidy of 1,700 yuan as low-income earners. Experts reached by the Global Times labeled the ruling as appropriate and reflecting humane judgment within the rule of law. "When handing down criminal sentences, the judiciary department tends to show greater leniency when humanity is involved," Liu Tao, a law professor from the Beijing-based Chinese People's Public Security University, told the Global Times, noting that the State did not suffer any substantial economic loss as all money owed was repaid. Feng Yujun, a law professor from Renmin University of China, told the Global Times that Liao "would not have defrauded the hospital" if his wife "had access to medical insurance." Chen Lihao, a member of the Zhuhai Committee of the Chinese People's Political Consultative Conference, who has helped Liao's family, posted on his Sina Weibo, "The sentence has made [Liao's] wish of continuing to take care of his family come true." Chen noted that the isolated case to some extent highlights problems with China's current medical insurance model. Five central government agencies released a circular on August 30 that stipulates urban and rural residents with medical insurance coverage can be reimbursed for at least 50 percent for medical expenses related to critical illnesses.